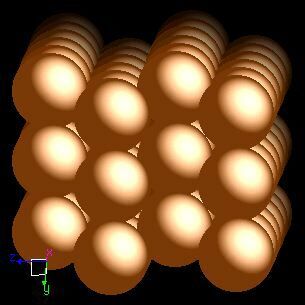 Magnesium atoms have 12 electrons and the shell structure is 2.8.2. The ground state electronic configuration of neutral magnesium is [Ne].3s2 and the term symbol of magnesium is 1S0. Magnesium: description Your user agent does not support the HTML5 Audio element. Magnesium is a grayish-white, fairly tough metal. Magnesium is the eighth most abundant element in the earth's crust although not found in it's elemental form. It is a Group 2 element (Group IIA in older labelling schemes). Group 2 elements are called alkaline earth metals. Magnesium metal burns with a very bright light. Magnesium is an important element for plant and animal life. Chlorophylls are porphyrins based upon magnesium. The adult human daily requirement of magnesium is about 0.3 g day-1. Magnesium tarnishes slightly in air, and finely divided magnesium readily ignites upon heating in air and burns with a dazzling white flame. 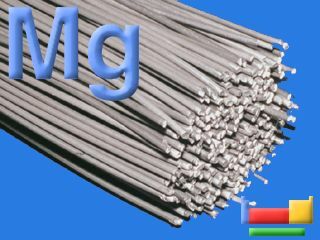 Normally magnesium is coated with a layer of oxide, MgO, that protects magnesium from air and water. The solid state structure of magnesium is: bcc (body-centred cubic). Magnesium is an important element for plants and animals. Chlorophylls (responsible for the green colour of plants) are compounds knonw as porphyrins and are based upon magnesium. Magnesium is required for the proper working of some enzymes. The adult daily requirement of magnesium is about 0.3 g day-1. Reactions of magnesium as the element with air, water, halogens, acids, and bases where known. Binary compounds with halogens (known as halides), oxygen (known as oxides), hydrogen (known as hydrides), and other compounds of magnesium where known. Bond strengths; lattice energies of magnesium halides, hydrides, oxides (where known); and reduction potentials where known. Magnesium was discovered by Sir Humphrey Davy in 1755 at England. Origin of name: from the Greek word "Magnesia", a district of Thessaly. 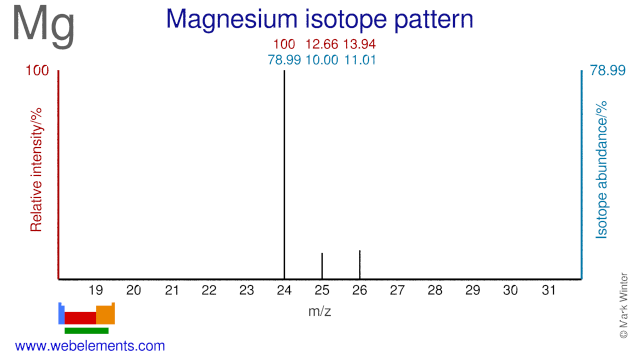 Isotope abundances of magnesium with the most intense signal set to 100%. Isolation: magnesium can be made commercially by several processes and would not normally be made in the laboratory because of its ready availability. There are massive amounts of magnesium in seawater. This can be recovered as magnesium chloride, MgCl2 through reaction with calcium oxide, CaO. Electrolysis of hot molten MgCl2 affords magnesium as a liquid whih is poured off and chlorine gas. The other methos used to produce magnesium is non electrolytic and involves dolomite, [MgCa(CO3)2], an important magnesium mineral. This is "calcined" by heating to form calcined dolomite, MgO.CaO, and this reacted with ferrosilicon alloy. The magnesium may be distilled out from this mixture of products.